In today's day in age we realize that just bringing you stellar videos in high-resolution, documentary on the fly photography in stunning resolutions simply isn't enough anymore.That's why we offer all these extras on this page, which we find quite unique, and most of which you won't find anywhere else. Don't you love it when a product is actually worth what you pay for? I know I do! We feel we've accomplished this for you, so you can feel secure, and happy in your joining! We want to give you every facet possible to get into the lives of Goddess Starla and her slave husband. The couple is on webcam every single week for your viewing pleasure. But - what is really amazing about this feature is that it allows you to really communicate with Goddess Starla and her sissy. Starla is always more than happy to take member requests...think he should get pegged with a huge didlo? Mention it to Starla in the live chat session! Want to see something that we haven't documented in our regular weekly HD upates? Ask her to do it on webcam! A full hour every week to engage, interact, and play with Starla and Her sissy! During these sessions, Starla likes to get to know you as well - so if you choose, you can even be dominated by the Goddess herself. She loves group maturbation - teasing and edging everyone in the chat really turns her on! ...Click Here to Join Now For Instant Access! Goddess Starla has begun taking applications for submissives of all kinds to have her hold your keys. It is a simple, but not necessarily easy process for Starla to own the only part of you that really matters. Strict obedience is expected. You will personally serve Starla, play her games, undergo her humiliations. You will provide proof of your not tampering with your chastity device. 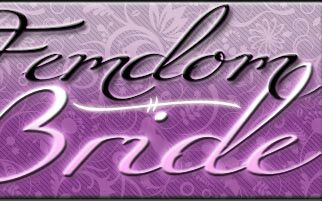 To apply to Goddess Starla you must first become a member of Femdombride.com - within the members area you will find a page called "contact us" - you will use this form to apply. Please Include: Your femdombride.com Username, A description of yourself, your lifestyle, your experience with chastity, and a 500 word essay detailing why you believe you should have the honor of having Starla hold the keys to your manhood.